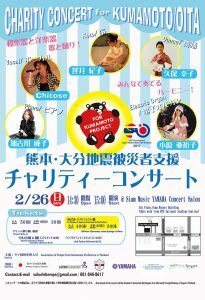 Association of people from Kumamoto Prefecture is holding a charity concert for the Kumamoto and Oita Earthquake that was happened in April this year. Japanese musicians and a dancer will perform the various genre of music including Anime song, J-pop, Japanese traditional and fork songs. All the proceeds we make in this concert will go to organizations supporting the Kumamoto and Oita recovery through The Embassy of Japan in Thailand.